The label of the tektites shown here, sample 2399, quotes the locality as Maoming City, in the coastal province of Guangdong, China. This material was purchased in 2003 from Crystal Grove (Blair Campbell) of West Hill, Ontario. The two tektites are composed of black glass, brownish-green and translucent on thin edges, with the form of pieces of orange peel: the interior (concave) sides are smooth, the exterior (convex) sides are rugose and heavily pitted. Each one is roughly 40x25x10 mm in size, with a very light feel: the combined mass of the pair is just 28 g. Coin diameter is 23 mm. Tektites from Maoming were recently analysed by Lee et al. (2004). Tektites, as recounted below, appear to be glassy bodies formed from sediments melted during large terrestrial impact events. Many but not all exhibit tubular to button-shaped forms, often with tiny surface ridges or bubbles, the overall shape consistent with a glass cooling and solidifying during its brief atmospheric passage during "re-entry". Because they are largely glass, possible sources of mistaken identity include glassy volcanic rocks (e.g., obsidian), slags and other industrial byproducts, and waterworn bottle glass recovered on beaches. Fulgurites (glassy bodies formed in lightning strikes) should be more readily distinguished from tektites. Another Chinese tektite (sample 1996, not shown, acquired from another dealer in 1999) was cut to yield a polished thin section. This tektite was said to be from Hunan, an inland province in southeast China, situated adjacent (north and northwest of) Guangdong. Tektites have also been recovered in Guangxi province and Hainan Island, respectively west and southwest from Guangdong. 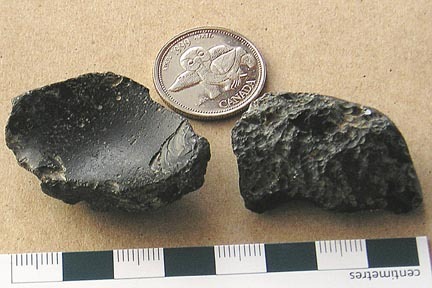 Hand specimen 1996 was quite large (50x30x15 mm), a flattened cylindrical tektite with a glossy black vesicular surface, essentially opaque but pale yellowish-green and translucent on thin margins. The glassy sample shattered on cutting, revealing a conchoidal fracture. It is not appreciably magnetic. Tektites from southeast Asia are referred to as indochinites. Some of them have a layered structure, and are referred to as Muong Nong tektites. Layering is quite unusual in tektites, but has also been noted in rare samples from the moldavite and georgiaite fields (central Europe and southeast USA: see on). The occurrence of layering, and of very rare "giant" tektites (>1 kg in mass) is perhaps limited to areas relatively near the impact sites from which the material is presumed to originate. The thin section of sample 1996 is virtually 100% isotropic glass, lacking prominent bubbles, some fractures concentrated within 0.5 mm of the sample margin, possible induced in sample polishing. Strain- induced anisotropy produces a yellowish colour in crossed-polars along cracks. Small colourless (?) mica crystallites are present, up to 80x40 µm in size. Reflected light reveals no additional heterogeneity, nor flow textures, nor opaque phases. A semiquantitative energy-dispersive x-ray analysis of major elements includes roughly 78% SiO2 (more siliceous than the vast majority of igneous rocks), 15% Al2O3, plus 2% FeO, 2% MgO, and 3% other major-element oxides (K > Ca > Ti > P, with no Na, Cl or S identified). This is a crude analysis using a defocused electron beam, and an effective detection limit of a few tenths of 1 wt.%: it is enough to note that it is compatible with detailed analyses performed on tektites from Vietnam and the Philippines (Son and Koeberl, 2005) and elsewhere, albeit somewhat (and perhaps spuriously) elevated in Al and depleted in Fe. Whole books and many articles have been written on tektites, so the reader is referred to a select few of these for more information. Tektites differ from meteorites in their restriction to specific areas of the Earth's surface, both on land and at sea. Their areas of occurrence are vast compared to meteorite strewnfields. Tektites are generally named for their host regions. The largest region is Australasia and Indochina (whence equivalent names for the Australasian strewnfield, australites and indochinites), including the breadth of Australia, much of the Indian ocean, Thailand, Laos, Cambodia, Vietnam and parts of China, Indonesia, Malaysia and the Philippines. Central Europe (notably Germany, the Czech Republic, and Austria) is host to the moldavites. The zhamanshinites (irghizites) have been recovered from Russia, while thailandite and philippinite are self-evident if perhaps superfluous elaborations on the theme. Another seldom-used term, billitonite, refers to an island in the Indonesian archipelago. Parts of the USA and Caribbean region, notably Georgia and Texas, host the georgiaites and bediasites. Microtektites have been recovered in drillcore from ocean drilling programs, in the Caribbean and off the Atlantic seaboard of the USA, and off the coast of west Africa (Ivory Coast / Côte d'Ivoire). Glasses are metastable and prone to alteration through time, but microtektites (or "spherules") have been recognized in strata back to Archean times, and and especially in Paleozoic, Mesozoic and Cenozoic strata. Here we will focus on macroscopic tektites, rather than smaller, more cryptic impact melt products. An excellent pioneering study of tektites and the wider question of impact melts was made by Spencer (1939). More recent overviews include McNamara and Bevan (1991) and McCall (2001). The most generally-accepted origin for tektites involves impact into terrestrial crustal sediments, consistent with a wealth of chemical and isotopic data (e.g., the excellent review of Shaw and Wasserburg, 1982; also Koeberl, 1988, 1993; Meisel et al., 1997; Lee et al., 2004; Son and Koeberl, 2005). Extraterrestrial volcanism (lunar volcanism in particular) is the most oft-cited alternative (e.g., Futrell, 1993; O'Keefe, 1994). Specific studies have addressed all the main tektite groupings, including Muong Nong tektites (Koeberl, 1992) and georgiaites (Albin et al., 2000). Glassy material has obvious uses in prehistory, and archaeological studies of tektite use have been made in ancient China (Hou et al., 2000) and in Georgia, USA (Povenmire and Cathers, 2004). Dating and stratigraphic work has focused on tektite / microtektite deposits as possible evidence of impact and extinction events. The indochinites and australites cover some 15% of the Earth's surface, the impact source believed to lie somewhere in Indochina, in the much smaller area where layered tektites occur. Their age is considered to be Pleistocene, circa 0.7 Ma. Perhaps the most riveting subject in recent tektite work has involved the search for a convincing source of the australite / indochinite tektites. Geological and remote sensing studies and the spatial analysis of tektite size and form have been applied to this end. Possible answers include sites or regions of Vietnam (Stauffer, 1978); the southern Thailand-Laos border (Schnetzler, 1992; Lee et al., 2004)); northeast Cambodia (Hildebrand et al., 1994); south-central Cambodia (Hartung and Koeberl, 1994); Laos (Schnetzler and McHone, 1996); and the tektite-rich region of Thailand-Laos-Vietnam (Fiske et al., 1999). Albin,EF, Norman,MD and Roden,M (2000) Major and trace element compositions of georgiaites: clues to the source of North American tektites. Meteoritics & Planetary Science 35, 795-806. Fiske,PS, Schnetzler,CC, McHone,J, Chanthavaichith,KK, Homsombath,I, Phouthakayalat,T, Khenthavong,B and Xuan,PT (1999) Layered tektites of southeast Asia: field studies in central Laos and Vietnam. Meteoritics & Planetary Science 34, 757-761. Futrell,DS (1993) Comment on "geochemistry and origin of Muong Nong-type tektites" by C.Koeberl. Geochim.Cosmochim.Acta 57, 4527-4529. Hartung,J and Koeberl,C (1994) In search of the Australasian tektite source crater: the Tonle Sap hypothesis. Meteoritics 29, 411-416. Hildebrand,AR, Rencz,AN and Graham,DF (1994) Phnum Voeene: source crater for the Australasian tektite strewnfield? GAC/MAC Prog.w.Abs. 19, 50, Waterloo. Hou,Y, Potts,R, Yuan,B, Guo,Z, Deino,A, Wang,W, Clark,J, Xie,G and Huang,W (2000) Mid-Pleistocene Acheulean-like stone technology of the Bose basin, south China. Science 287, 1622-1626. Koeberl,C (1988) The origin of tektites: a geochemical discussion. Proc. NIPR Symp.Ant.Mets. 1 (papers of the 12th Natl.Inst.Polar Res.Symposium, 1987), Tokyo, 323pp., 261-290. Koeberl,C (1992) Geochemistry and origin of Muong Nong-type tektites. Geochim.Cosmochim.Acta 56, 1033-1064. Koeberl,C (1993) Reply to the comment by D.S. Futrell on "geochemistry and origin of Muong Nong-type tektites". Geochim.Cosmochim.Acta 57, 4531-4532. Lee,Y-T, Chen,J-C, Ho,K-S and Juang,W-S (2004) Geochemical studies of tektites from East Asia. Geoc.J. 38, 1-17. McCall,GJH (2001) Tektites in the Geological Record: Showers of Glass from the Sky. Geol.Soc., Earth in View 1, 256pp. McNamara,K and Bevan,A (1991) Tektites. Western Australian Museum, Perth, 2nd revised edition, 28pp. Meisel,T, Lange,J-M and Krahenbuhl,U (1997) The chemical variation of moldavite tektites: simple mixing of terrestrial sediments. Meteoritics & Planetary Science 32, 493-502. O'Keefe,JA (1994) Origin of tektites. Meteoritics 29, 73-78. Povenmire,H and Cathers,CL (2004) A Georgia tektite worked into a Clovis-type arrow point. Meteoritics & Planetary Science 39, A86. Schnetzler,CC (1992) Mechanism of Muong Nong-type tektite formation and speculation on the source of Australasian tektites. Meteoritics 27, 154-165. Schnetzler,CC and McHone,JF (1996) Source of Australasian tektites: investigating possible impact sites in Laos. Meteoritics & Planetary Science 31, 73-76. Shaw,HF and Wasserburg,GJ (1982) Age and provenance of the target materials for tektites and possible impactites as inferred from Sm-Nd and Rb-Sr systematics. Earth Planet.Sci.Letts. 60, 155-177. Son,TH and Koeberl,C (2005) Chemical variation within fragments of Australasian tektites. Meteoritics & Planetary Science 40, 805-815. Spencer,LJ (1939) Tektites and silica-glass. Mineral.Mag. 25, 425-440. Stauffer,PH (1978) Anatomy of the Australasian tektite strewnfield and the probable site of its source crater. In `Proceedings of the Third Regional Conference on Geology and Mineral Resources of Southeast Asia' (Nutalaya,P editor), Asian Institute of Technology, Bangkok, 887pp., 285-289. "Rock of the Month Index"
(specimens related to China, and Beijing, appear below). The "Rock of the Month"